Colombia is a country of many misconceptions. Abroad, the South American nation has suffered from age-old stereotypes and misidentification – seriously, it’s Colombia, NOT Columbia – but none of it has ever stopped its people from being known as some of the happiest on earth (if you don’t believe us, here’s proof). What makes Colombia unique goes beyond the passion and joy of its soccer team, itsmagnificent biodiversity, the beauty of its women and even the folkloric sounds of Vallenato and Cumbia heard across the country. In fact, its true beauty comes from the warmth of its people. Whether you visit Medellín and its “eternal spring,” the highland climate of Bogotá or the tropical paradise found in the historic port city of Cartagena – you’re bound to find a friendly face and a hot plate of the region’s specialty. 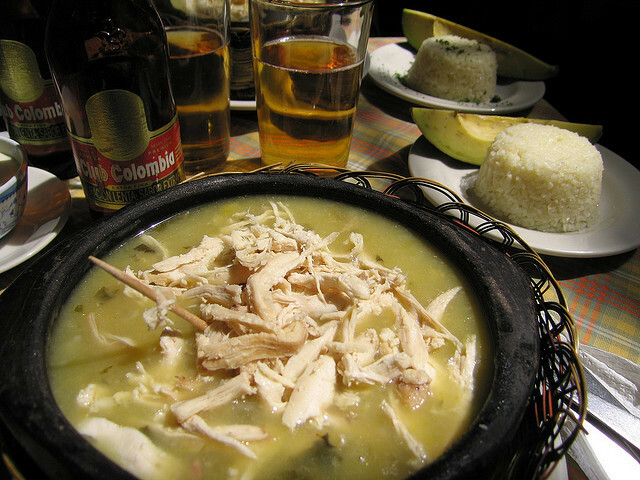 Colombian cuisine is as diverse as the country’s 32 departments, and it’s one thing tourists can’t get enough of. 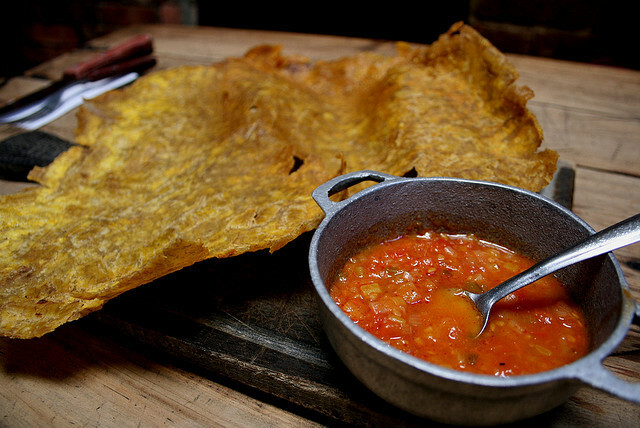 So, here are 23 food reasons why Colombians know what’s good. They’ve found the best way to eat corn. 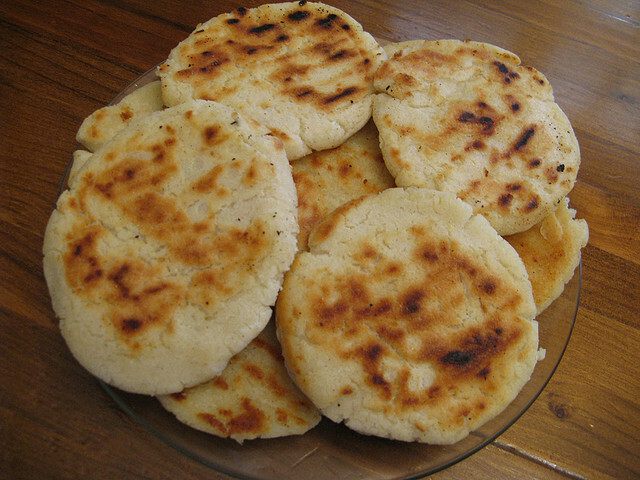 Arepas, or “corn cakes,” are not the sweet baked goods their English translation may indicate. 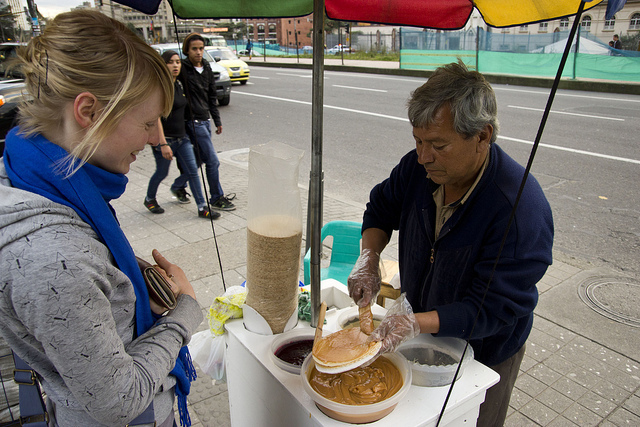 They are to Colombians what tortillas are to Mexican – as in they go with anything at any time and any place. Arepas come in different sizes and varieties. In the department of Antioquia, you’ll often find a small white arepa on your plate as a side, while in Boyacá they prefer larger buttery arepas made with cheese. Other varieties? Arepa de Huevo, an arepa stuffed with an egg, and arepa de choclo for true corn lover. The one thing they have in commong? They’re all delicious. They know that going to a bakery should feel a lot like going to the candy store. Buñuelos, almojábana, pandebono, pan de yuca, palitos de queso (all varieties of cheese bread) are just some of the options you can find at your corner bakery. 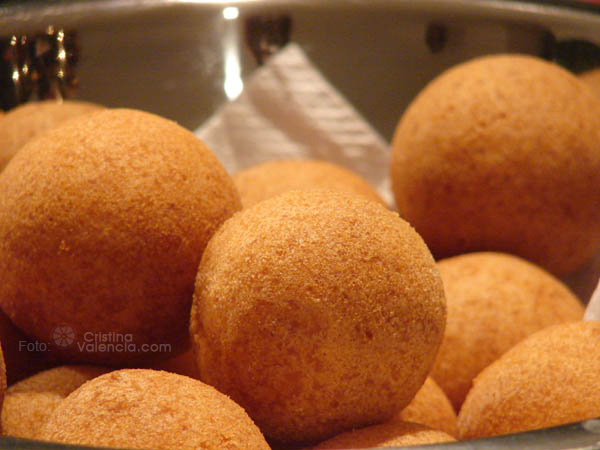 Buñuelos (pictured above) are cheese fritters eaten year-around but are a special treat at Christmas time. They know the true meaning of a filling meal. 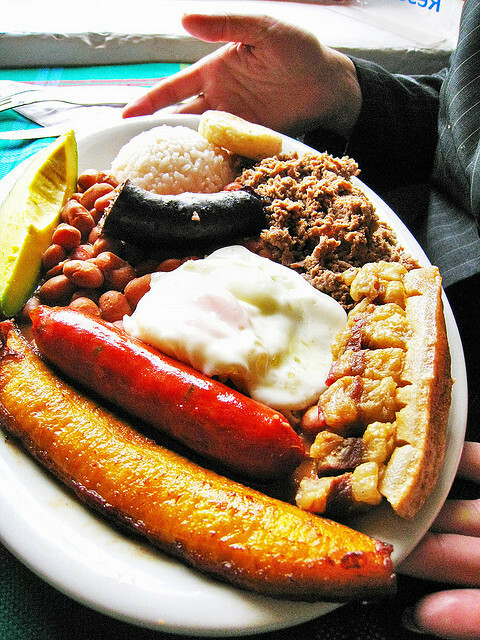 In Colombia, the word “paisa” isn’t really used to identify fellow countrymen, across the country people from the departments of Antioquia, Risaralda, Caldas and Quindío are called “paisas” – hence, la bandeja paisa (the paisa platter). What does this colorful dish have to offer? Ground beef, egg, arepa, chorizo, avocado, rice, red beans and chicharron (more on that later), fried plantains, morcilla (blood sausage). Yes, that’s all for one person. They’ve discovered the perfect dish for a beach meal. Nothing says oceanfront cuisine like fish and coconut, so why not combine the two? 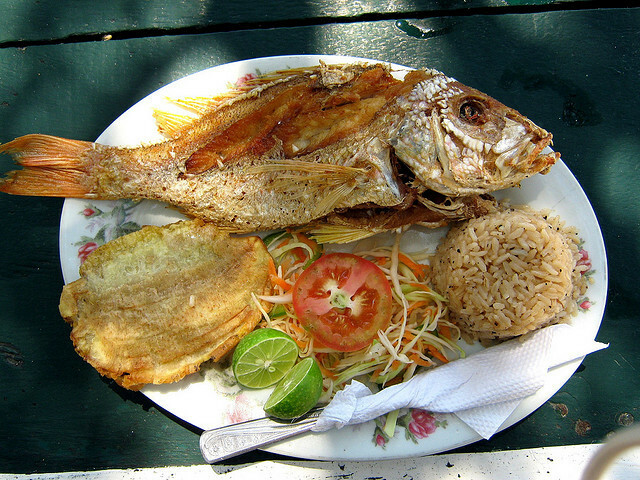 Along Colombia’s coast you can find fried mojarra accompanied by a side of coconut rice and patacones (these are fried green plantains we will discuss in detail later). They’ve perfected the beef patty, a.k.a a delicious mini meal conveniently stuffed in a crunchy envelope. 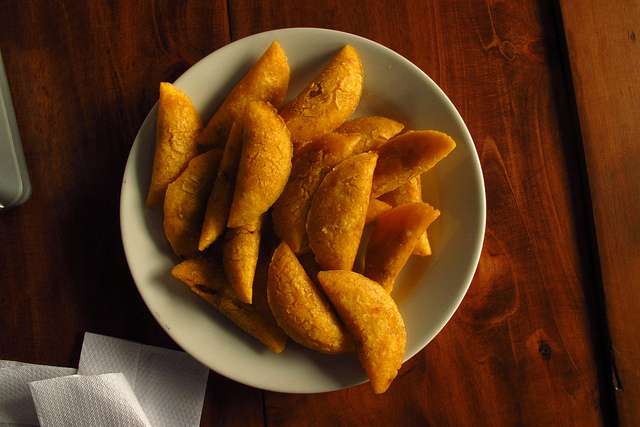 Like arepas, the fried patty is made from yellow cornmeal, or masarepa. This ingredient is what sets Colombian empanadas apart from, let’s say, Argentine flour empanadas. Both, however, can be filled with anything from shredded meat and potatoes to chicken to cheese. This snack can be found in little plaza stands or street carts and can be served at any time of day. But why stop there? Add some ají, lime or pineapple sauce for some extra flavor. They know food must never be wasted. Who said beans and rice can’t be a part of a complete breakfast? 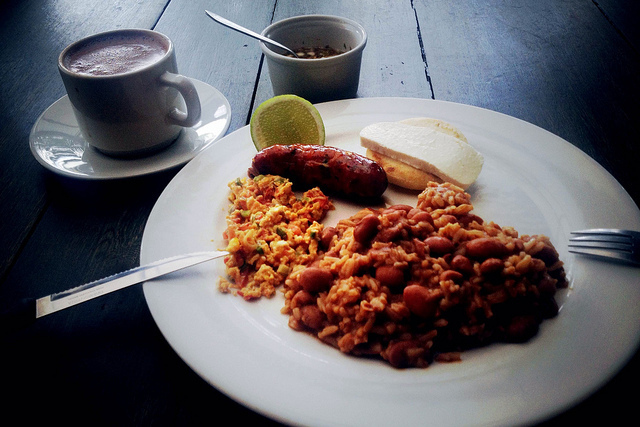 Calentado or Calentao literally translates to “heated.” In the Andean region, especially, Colombians regularly enjoy beans and rice for dinner and Calentado was born as a way to consume what was left from the night before in the morning by adding an arepa, egg, chorizo and more to the plate. Thus, this dish is nothing but reheated leftovers. If you think that makes it any less delicious, you’d be mistaken. They know that the best way to enjoy avocado is not by making guacamole. For Colombians the best way to eat avocado is by slicing it in half, taking a spoon and scooping it up straight. 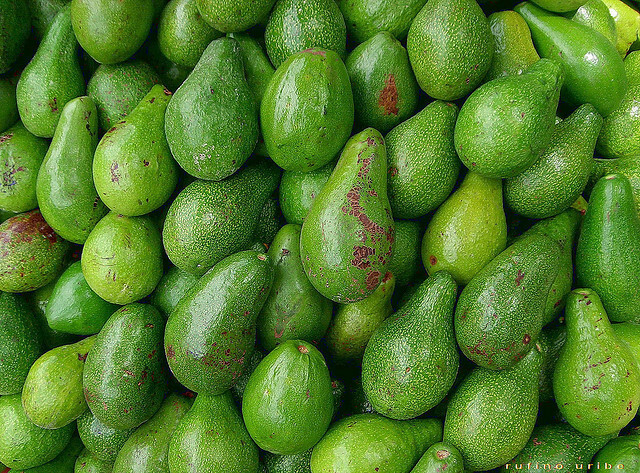 There is nothing that cannot be eaten with avocado; a slice of the green superfood is bound to top every regional dish and compliment any meal. They’ve created their own type of hot sauce. Colombians may not enjoy spice the way Mexicans do, but it doesn’t mean they don’t know how to heat things up. Ají is a special sauce that can be found in practically every restaurant, regardless of the region. Made from diced tomatoes, cilantro, chopped green onions, vinegar, water, lemon juice and, of course, ají or habanero pepper. This sauce is perfect for grilled meats, empanadas, patacones, arepas and much more. This anise-flavored liquor is derived from sugarcane, but don’t expect it to be sweet. 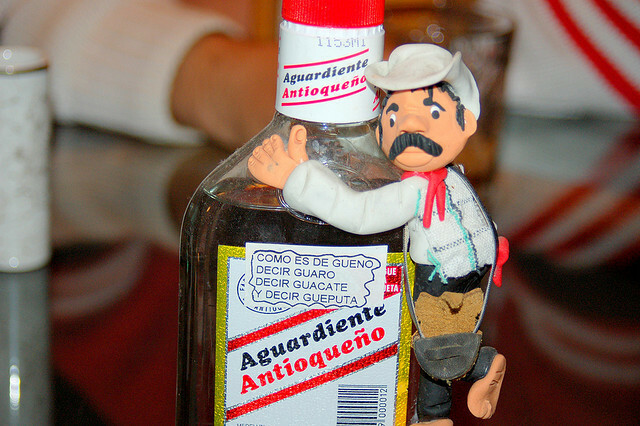 Aguardiente – colloquially known as “guaro” – has an intense flavor so it’s no surprise its name translates to “burning water.” Guaro is Colombia’s signature drink and at least one bottle never fails to make an appearance at any party. Pro tip:Aguardiente is about sharing, which means if there is one bottle, three plastic shot glasses and 10 people – don’t expect to get your own personal cup. They’re masters of comfort food. There is likely no better combination of sweet and salty than baked plantains topped with guava and melted cheese. It will instantly turn that frown upside down and make you realize that Colombians know no boundaries when it comes to tasty treats. 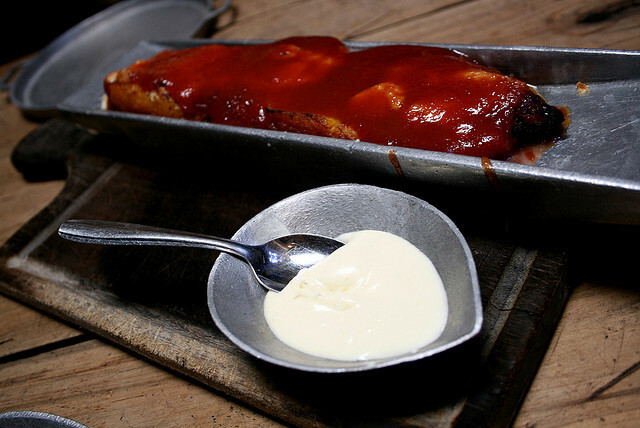 They know that if you can’t decide between pork belly or pork ribs – for breakfast – you don’t have to. Tamales from the Tolima department are a delicious breakfast enjoyed all across the country. 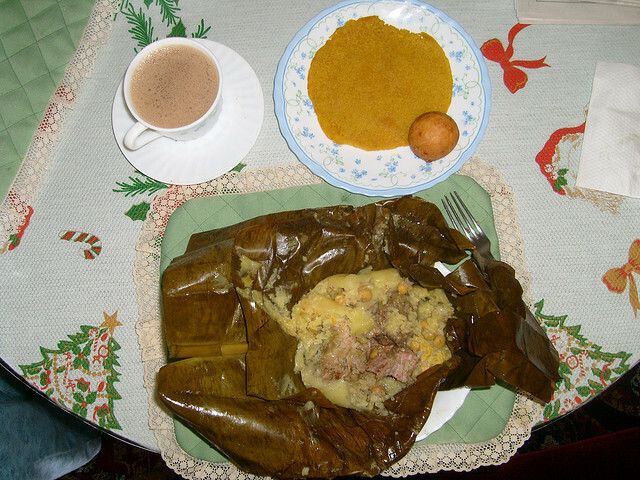 In Colombia, where bananas abound, the tamales are wrapped in plantain leaves. Inside, the filling comes with chicken, pork belly, pork ribs, boiled eggs, carrots, peas, potatoes, rice and more. Yup, that’s breakfast. Oh and did we mention it usually comes with hot chocolate and an arepa? They’ve figured out how to make medicine out of a spoon full of sugar – sort of. Aguapanela, which translates to “panela water,” can be served hot and with a little lime to help cure any flu or it can be served cold to cool down during those sunny summer days. Panela is a sweet, solid block that is derived from sugar cane and adding lime to the drink helps make the drink less sweet to suit your palate. They take dessert very seriously – and very sweet. Oh you thought dulce de leche only existed in Argentina? Nope. 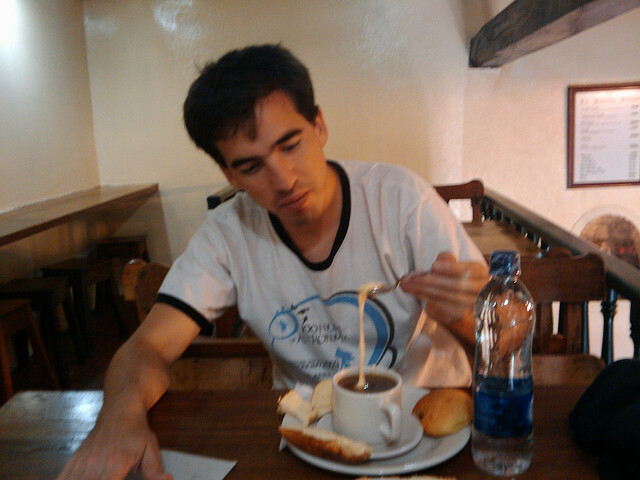 In Colombia this delicious elixir prepared by slowly heating sweetened milk is called arequipe. This scrumptious concoction can be enjoyed in many ways but nothing beats smearing a thick serving of arequipe on the impossibly thin and round wafers known as obleas. Seriously, their side dish game is unrivaled. As if all of the delicious snacks and treats available to Colombians weren’t enough, let’s add an oversized fried green plantain topped with a special tomato and onion sauce. 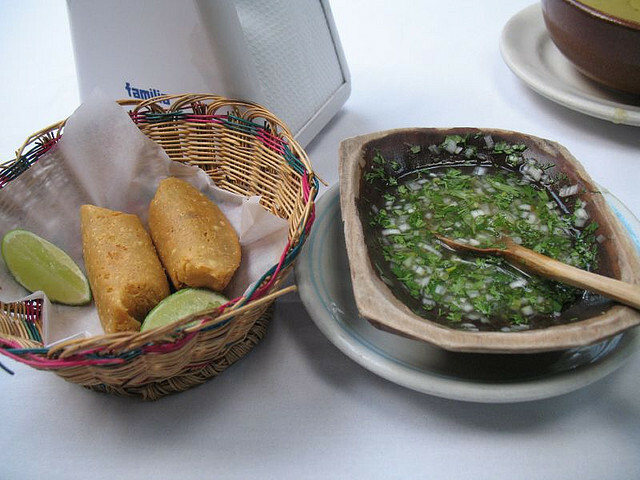 A “patacón con hogao” can be served as an appetizer or frankly just as a side to one of the many national dishes. They know how to drink coffee. Duh. Colombians drink their coffee black. That’s it. 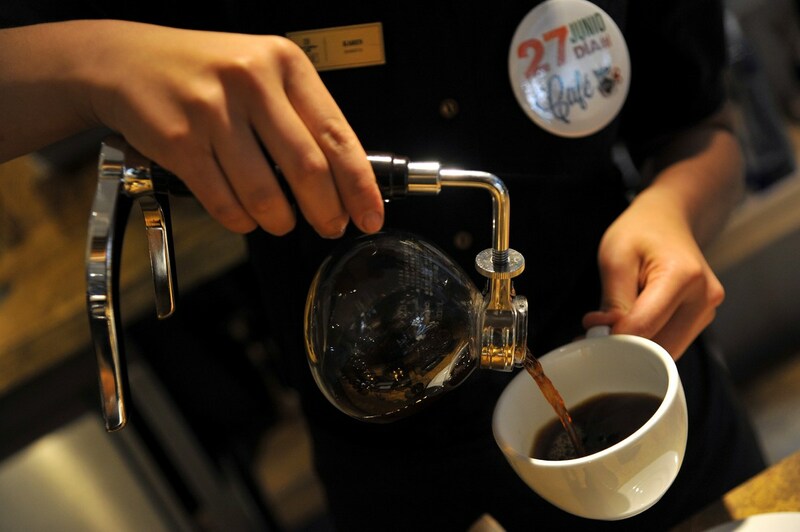 No fancy concoctions or flavors, just the pure aroma and taste of fresh ground coffee. 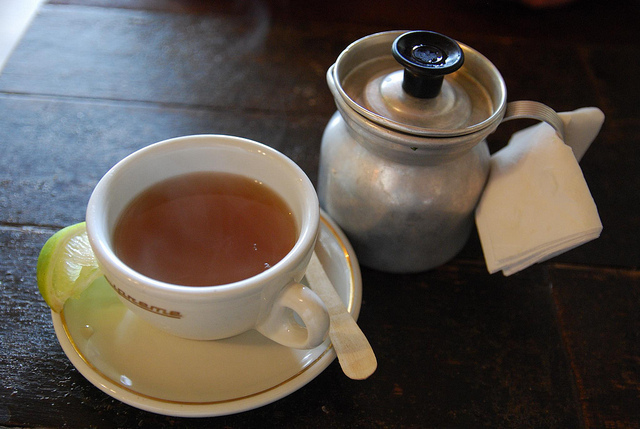 But don’t expect most people to ask for “un café,” in the South American country people drink tinto. 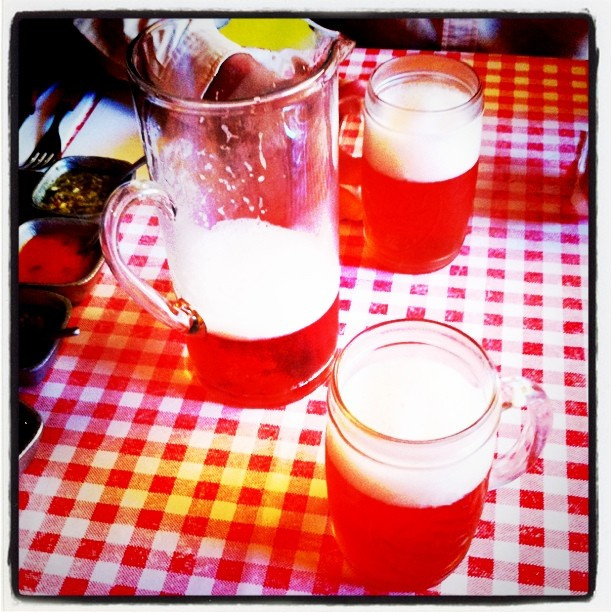 Colombians will often enjoy their tinto after a meal or when having a long conversation with a friend. You just can’t go wrong when it comes to Colombian coffee. 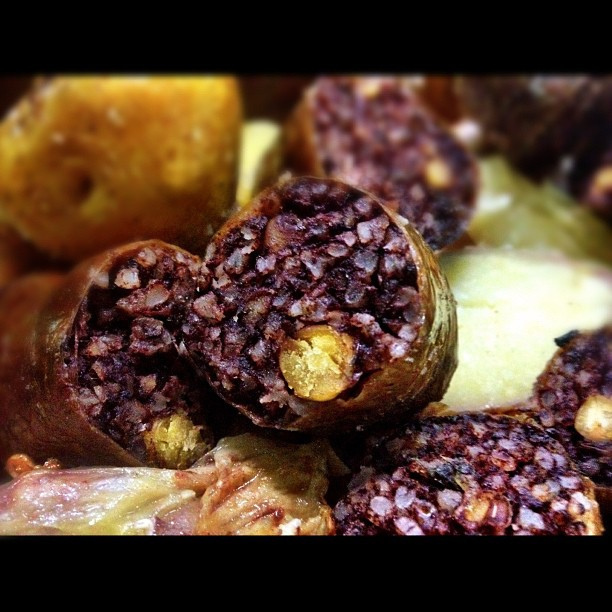 They’ve managed to make blood sausage more than an acquired taste. If the idea of eating what is essentially a sausage filled with dried blood is less than enticing, never fear, Colombians have the answer. For them, morcillas should also be stuffed with rice, peas, onion, parsley and a few more ingredients that make them a beloved addition to any platter. They’ve figured out how to make hot chocolate BETTER. Sure, nothing warms you up quite like a large cup of hot chocolate. So how can you make it better? Add cheese. Colombians are known for dropping pieces of double cream cheese into hot chocolate, which after some time melts. They have fruits you can’t find anywhere else. 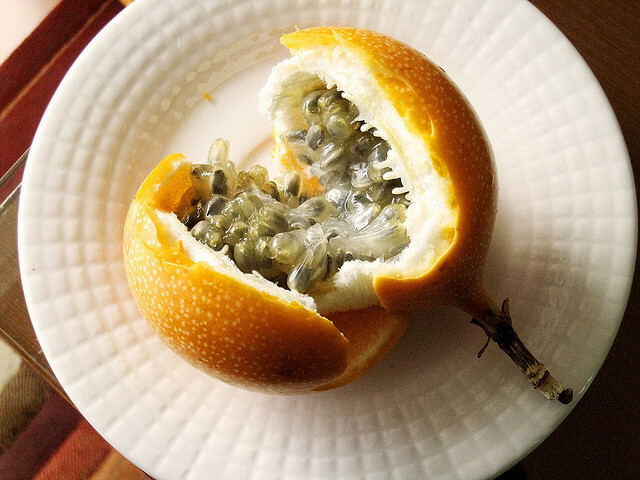 Pitaya, lulo, granadilla (pictured above), mamoncillo, guanabana, cherimoya, tomate de arbol, uchuva, zapote, curuba…just to name a few. 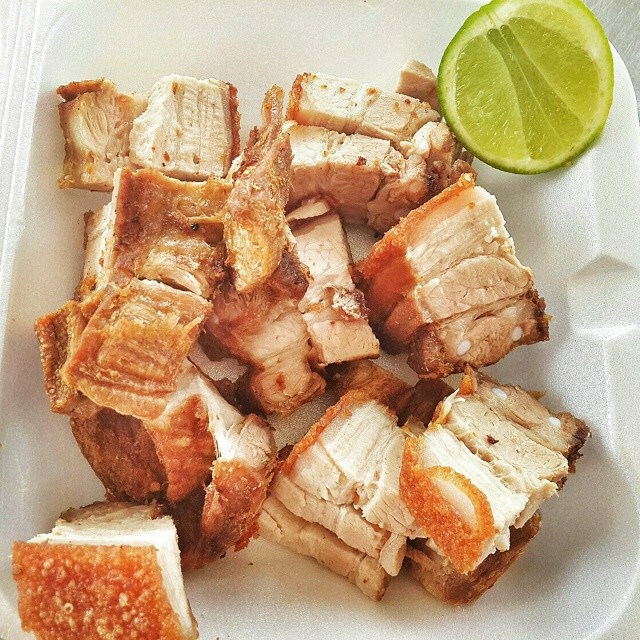 It’s not simply pork rinds, Colombians like a lot more meat on their skin. The fried pork belly has the crunchy skin on the outer rim and the soft meat on the inside. It’s a guilty pleasure, so don’t start counting calories. They’ve made a national cocktail out of beer and soda. Refajo, a mix of beer and the national kola champagne known as Colombiana, is a big hit at barbecues and family gatherings. It may not be fancy but it sure is delicious. They’re not afraid to eat pork straight from the source. 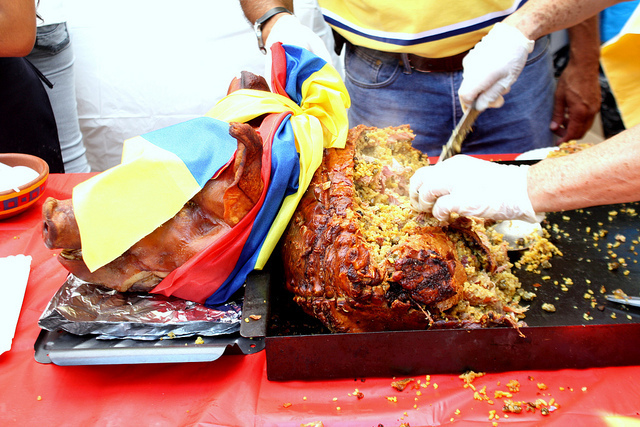 Whether its celebrating Independence Day or Christmas, Lechona is a ridiculously popular dish – nay, an event — across the country. It’s made with peas, green onion, yellow rice and spices which are all stuffed within a roast pig and cooked in a brickoven for several hours. The process is lengthy but lechona is always a crowd pleaser. We weren’t lying when we said arequipe was the perfect compliment to anything, including fruit. 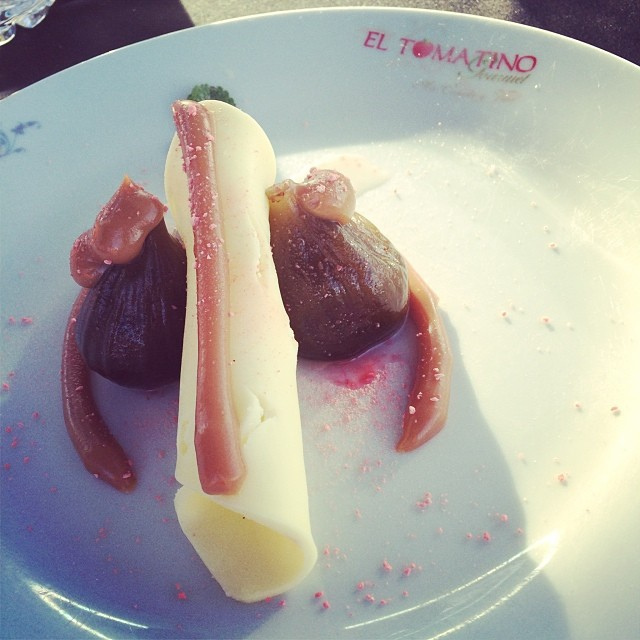 A popular Colombian dessert is brevas con arequipe (figs with arequipe), a tasty treat often accompanied by a fresh slice of cheese. So you can feel (a little) less guilty about your sweet tooth.